Pioneers in the industry, we offer dual speed motors, inverter duty motor, three phase standard motor, single phase ac induction motor, cooling tower motor and forced cooling tower motor from India. 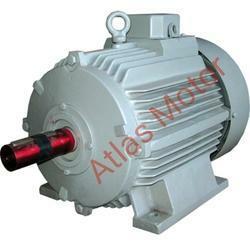 We are a manufacturer, exporter, and supplier of “ATLAS” Make “Atlas” Make Dual speed Motor In the year 1978 since Company establishment it in our products range. Dual Speed motors specially designed for Working in Two different speeds. Designed for work in applications in which multiple speeds are required. Dual Speeds Motor are supplied in a robust, rugged cast iron frame with integral feet. On Request, we can supply motor in the aluminum body up to 100 L frame. All dual speed motor is supplied with ‘F’ class insulation but the temperature rise restricted to ‘B’ class. Dual Speed Motors are supplied with “F” insulation as the standard feature. Also, supply H on request of the customer. We supply the motor with Ingress protection 44 as defined in IS: 4691. Motors can be supplied with IP-54 and IP-55 on request. A shaft is Made from high carbon steel to provide exceptional Strength & rigidity to minimize deflection. Rotors are of high-pressure E.C. Grad aluminum die-cast. Every rotor is dynamically balanced. It makes motor low amplitudes of Vibration & noise. Bearings are adequately lubricated with lithium-based high temp up to 150 deg. All Dual Speed motor is supplied with C3 ball bearing & fully charged with lithium base grease at the time of assembly. We can also supply Two Speed Motor with T.O.P Switch on Demand of Customer. It can provide motor extra safety form overlord protection. All motor is painted with semi-glossy synthetic enamel paint. However sp. Paint is available on request. Dual speed motor is used in Many application which multiple speeds are required. Pharmaceuticals, Crane, hoist, lift, construction, Chemical industries, Food equipment, Ceramic industries Machine tools for different application. We can also provide dual speed gear motor, dual brake motor. 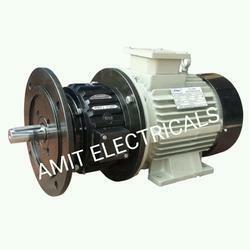 Amit Electricals manufactures supplier and exporter of Inverter Duty motor. Inverter duty especially winding designed for operations requiring wide speed variation through variable Frequency Drives. These motors are generally used when the motor is running for the longer duration at speeds below 70% of rated nameplate speed. Atlas Inverter duty motors operate at constant torque up to rated design frequency when connected with variable frequency drives. Inverter Duty motor is supplied in a robust, rugged cast iron frame with integral feet. On Request, we can supply motor in the aluminum body up to 100 L frame. Supply volts 415 +- 5% 3 phase 50 Hz. ± 3% We are also capable of Manufacturing three-phase motor in different volts and frequency Like 220, 380, 460, 525. We supply Inverter Duty motor with Ingress protection 44 as defined in IS: 4691. Motors can be supplied with IP-54 and IP-55 on request. We can also supply Inverter Duty motor with T.O.P Switch on Demand of Customer. It can provide motor extra safety form overlord protection. Inverter Duty motor is fitted with the separate cooling arrangement which ensures that the motors perform successfully at lower speeds without over-heating of the motor. This also ensures that the loading capacity of the motor is not reduced in this range. Inverter Duty motor supply with class F insulation as the standard feature. Also, supply H on request of the customer. Amit Electricals Manufacturing Three Phase Standard Motor since 1978. We are having wide experience manufacturing finest quality products three-phase motor. All Three-phase Motor is supplied in a robust, rugged cast iron frame with integral feet. On Request, we can supply motor in aluminum Presser Die cast body up to 100 L frame. All Three-phase Motors are continuous (S1) rated to comply with performance standards. Standard Three phase motor Supply volts 415 ± 5% 3 phase 50 Hz. ± 3% We are also capable of Manufacturing three-phase motor in different volts and frequency Like 220, 380, 460, 525. Three Phase Motor supply with class B & F insulation as the standard feature. Also, supply H on request of a customer. All Three phase motor is painted with semi-glossy synthetic enamel paint. However sp. Paint is available on request. Amit Electricals Manufacturer, Exporter, and Supplier of “ATLAS” Brand Cooling Tower Motor. Cooling Tower Motor special design for Cooling Tower Fan. Cooling tower motor specially designs for work in humidity area at continually. All Cooling Tower Motor is supplied in a robust, rugged cast iron frame. Cooling Tower Motor Supply volts 415 ± 5% 3 phase 50 Hz. ± 3% We are also capable of Manufacturing three-phase motor in different volts and frequency Like 220, 380, 460, 525. All Cooling Tower Motor provided with minimum two earthling terminals. One in the terminal box and another outside on Body. Cooling Tower motor is painted with semi-glossy synthetic enamel paint. However sp. Paint is available on request. Amt Electricals manufacture, exporter, and supplier of force cooled motors. It utilized in many of industry, from the food processing industry to rolling mills and offshore applications. All of these require strong robust motors and blowers to withstand the specific environment and offer the continued peace of mind. Varied designs of our force ventilation units are available for any specific specification or application field. All force ventilations are specially manufactured to the customer’s unique motor design and special adoptions such as brakes or encoders are taken into consideration during our design phase. Whether the force ventilations are assembled at production for specialized projects or fitted as an after package, ease of fitment is guaranteed. Our units are offered complete with terminal box and are delivered primed or to your specific. Force Cooled Motors are supplied in a robust, rugged cast iron frame with integral feet. On Request, we can supply motor in aluminum Presser Die cast body up to 100 L frame. Force Cooled Motors Supply volts 415 ± 5% 3 phase 50 Hz. ± 3% We are also capable of Manufacturing three-phase motor in different volts and frequency Like 220, 380, 460, 525. Force Cooled Motors supply with class “F” insulation as the standard feature. Also, supply H on request of the customer. All Three phase motors are painted with semi-glossy synthetic enamel paint. However sp. Paint is available on request. All Dual voltage motor Motors are continuous rated to comply with performance standards. 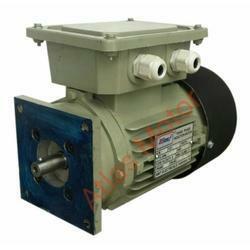 Amit Electricals Manufacturer, Exporter, and Supplier of Square Flange Motor. Our firm specializes in providing a quality array of Square Flange Motor. We are engaged in providing superior quality of Square Flange Mounted Motor. Our product is fabricated using the superior grade of raw material which is procured from reliable vendors. Our offered range of Square Flange Motor is widely available in the market at competitive prices. The offered Square Flange Motor developed with tested components which ensure its performance. These Square Flange Motor are extremely valued in the global market for effective working. To meet fulfill requirements of clients, these flange mounted motors are offered in different specifications. 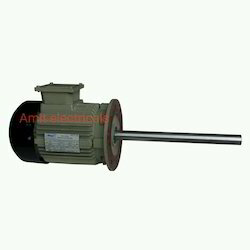 Amit Electricals Manufacture, Exporter, and Supplier of Long shaft motor. It Totals custom built motor. 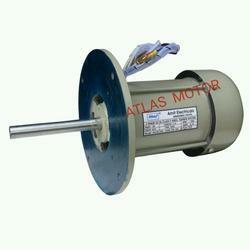 We are manufacturing Long Shaft motor as per customer requirements. Three Phase Long shaft motors are supplied in a robust, rugged cast iron frame with integral feet. On Request, we can supply motor in the aluminum body up to 100 L frame. All Long shaft motor Standard Motors are continuous rated to comply with performance standards. Long shaft motor is IP-44 Protection as defined in IS: 4691. Motors can be supplied with IP-54 and IP-55 on request. Three Phase Long shaft motor supply with class B & F insulation as the standard feature. Also, supply H on request of the customer. Long shaft motor shaft Made from high carbon steel Pipe to provide exceptional Strength & rigidity to minimize deflection. Also available in S.S. 304, 316, 410 or any other specific material. Long shaft motor Bearings are adequately lubricated with high temp up to 150 deg. All the motors are supplied with C3 ball bearing & fully charged with lithium base grease at the time of assembly. Long shaft motor Supply with Enclosure T.E.F.C. (Totally Enclosed Fan Cooling). Long shaft motor provided with minimum two earthling terminals. One in the terminal box and other on foot. All standard Three Phase Long shaft motor is painted with synthetic enamel paint. However sp. Paint is available on request. Long shaft motor are widely Use in Pump, Gear Box, Chemical, Textile. 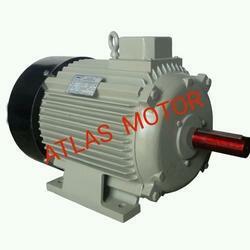 We are the manufacturer, exporter and supplier of “ATLAS” Make crane Duty motor. Its special design for crane application. our crane duty motor designs for frequent Starts / Stops & Reversing operation with high torque. It Manley use in a crane, Goods lift, hoist, auxiliary motors in rolling mills Ect. Crane duty motor is supplied in a robust, rugged cast iron frame with integral feet. On Request, we can supply motor in the aluminum body up to 100 L frame. Crane hoist duty motor can be supplied with integral electromagnetic A-c or DC fail-safe brakes. Crane duty motor is supplied with class “F” insulation as the standard feature. Also, supply H on request of the customer. In crane duty, motor torque plays the part so it needs to special Winding design for fulfilling application demand. Motor winding design making high torque of pick up lord smoothly. 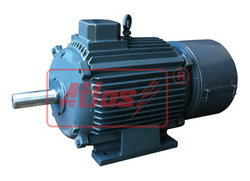 All motor is suitable for operation with Direct on Line starter (D.O.L) starter. Crane motor Rotor is positive locking with Shaft key joint so that cannot move on high Full lord torque. Shafts Are made by En-8 or En-9 material in sp. A case we can make Shaft with an En-24 material. Crane duty motor Rotors are of high-pressure E.C. Grad aluminum die-cast. Every rotor is dynamically balanced. It makes motor low amplitudes of Vibration & noise. Crane duty motor Bearings are adequately lubricated with lithium-based high temp up to150 deg. All the motors Are supplied with C3 ball bearing & fully charged with lithium base grease at the time of assembly. 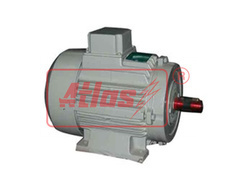 We can also supply Single phase Brake Motor with T.O.P Switch on Demand of Customer. It can provide motor extra safety form overlord protection. Single phase Brake Motor Supply with Terminal box on top position For Foot mounted (B3). Another position box like left or right supply on customer request. Single phase Brake Motor provided with minimum two earthling terminals. One in the terminal box and other at the foot. All standard Crane hoist duty motor is painted with semi-glossy synthetic enamel paint. However sp. Paint is available on request. Crane duty motor supply with class “F” insulation as standard feature. Also supply H on request of customer. Motor torque is higher than stander motor. Motor winding design making a high torque of pick up lord smoothly. All motor are operation with D.O.L. starter. 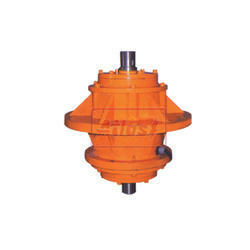 We are manufacturer, exporter, and supplier of Crane Duty Two speed brake motor. It Combination three type motor in one crane duty motor, two-speed motor, and Brake motor. It uses in crane, and hoists in lifting and crane traveling application. 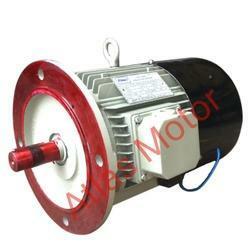 We are manufacturer, exporter, and supplier of two type of brake motor. Fail-safe brake motor in case of power supply off ensuring further to a precise stop and quick braking action, the security of sudden inter venations in case of an unintentional power supply failure (i.e. 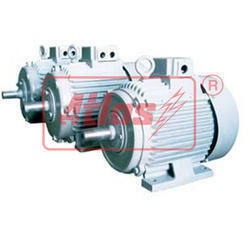 power supply black-out, equipment failure)The braking action is obtained without axial sliding of shaft and a provides equal braking torque in both directions of rotations. Crane Duty Two Speed Brake Motor is supplied in a robust, rugged cast iron frame with integral feet. On Request, we can supply motor in the aluminum body up to 100 L frame. All Crane Duty Two Speed Brake Motor is supplied with F class insulation but the temperature rise restricted to B class. Crane Duty Two Speed Brake Motor supply with class F insulation as the standard feature. Also, supply H on request of the customer. Bearings are adequately lubricated with lithium-based high temp up to 150 deg. All the Crane Duty Two Speed Brake Motor are supplied with C3 ball bearing & fully charged with lithium base grease at the time of assembly. We can also supply Motor with T.O.P Switch on Demand of Customer. It can provide motor extra safety form overlord protection. All Crane Duty Two Speed Brake Motor are painted with semi-glossy synthetic enamel paint. However sp. Paint is available on request. In the domain of high-grade Torque Motor for Textile Industries, we have established ourselves as prominent names in the market. These products are made from the quality assured ingredients under the assistance of the experienced professionals. These motors are quality tested to ensure their quality and optimum performance. We are offering these motors at pocket-friendly prices. Torque motor Is Design to Work Continues. Torque Motor Supply With S1 Duty. Three Phase Torque Motor Supply volts 415 - 5% 50 Hz. - 3% customer request we are also able to supply motor in 220, 380, 460, 525 volts on HZ. 50 or 60 Also. Torque motor Supply with Enclosure T.E.F.C. and T.E.S.C. For Sp. Application Where the need to run the motor in more than 75% lower Rpm for that We supply Torque motor with Force cooling arrangement. it can improve to the motor winding longer life and trouble free working. Torque motor used in textile industries, wire/cable winding machine, plastic industries, paper mill machine, Steel rolling industries, machine tools, etc. Torque motor widely Use in In Application where the need to material wind on drum or Bim. Power 0.5 to 10 Hp. We are a unique and trustworthy name in the industry in providing our precious clients an exclusive array of Vibrating Motors for Food Equipment. Offered motors are exclusively manufactured and designed using the best quality components and modern technology in tune to the set industry quality norms. Moreover, to ensure the best quality, the provided motors are stringently tested by experienced quality experts. Being one of the reputed firms in the industry, we are providing an extensive range of Center Flange Vibratory Motor for Chemical Industries. Procured from authentic resources of the market, the offered motors are designed using quality assured raw material and new technology. In addition to this, we are providing these motors to our clients with diverse specifications to cater to clients' specific requirement. 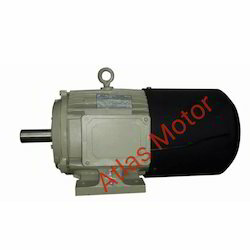 Looking for Industrial Motor ?